Good morning, Thursday is here and one of the bros will be leaving. Despite DR’s made to look like Sam is still undecided about using her power to save one, she isn’t. Sam has plenty of other stuff to deal with this week which I’ll get to later. Here’s my thoughts on last night’s episode before I recap what happened yesterday in the house. The edits have been mostly on point so far. BB18 episodes RARELY reflected what was going on in the house and this season has been fairly accurate. I just finished BB Canada 6 before BB20 started and this is miles ahead. BBCAN makes up what they want the story to be and they follow it no matter what. Johnny RAN that BBCAN house but because they’d already decided who they wanted the mastermind to be, they didn’t air it that way. You’ll see a lot of BBCAN comparisons from me because it was on right before BB20 and because something is happening this season that is more of a BBCAN theme, not BBUS. I’ll get to that later too. Winston got the Ahole edit and Kaitlyn got the crazy edit so it was accurate imo. I like the JC & Fessy interaction in the show clips and on the feeds. They’re very entertaining together. Fessy wants confirmation from the ladies all the time on his looks and JC never misses a chance to shoot him down and get under his skin. Can I just say, I’d like to burn Winstons tuxedo t-shirt? Brett’s veto speech was funny and I don’t think it’s a coincidence it was the first ones to be shown this season. For the record, Bayleigh went downstairs, told Kaitlyn the bros were trying to get her otb then Kaitlyn got a “hit” in her dream about it….in that order! Brett and Fessy -Brett and said he wanted to secretly work together. Fessy seemed to be considering it because JC had already done some good work about keeping Brett. JC pointed out Fessy wouldn’t be as big of a target if Brett was still there. Fessy had also been getting concerned that only guys are leaving. Brett brought this up and it temporarily hit the mark at least a little. They played charades, never have I ever and hide and go seek last night. They also did some of Rachels improv pretending to be the other hgs. Rachel and Fessy talked in the storage room about liking each other, working together, etc. They know they’re on opposite sides but Rachel said something about how ‘we have that connection from last year.’ I have no idea what that means. Bayleigh and Hayleigh talk more about targeting Tyler because he’s good with everybody. RS’s been saying this for a long time already. The all-girls alliance was officially formed yesterday. RS allowed Angela, Sam and Kaycee to be invited into it. (Before, they’d only talked to Rachel about it) Every female in the house is now included. I have so many thought on this so I’ll just put them at the bottom after the recap. Hayleigh tells Fessy she’s sad for Brett to leave because she likes him and Fessy asks Hayleigh to promise she’s evicting Brett. (Talk with Brett didn’t stick) She asks him why she needs to promise him anything. (Even if she isn’t wavering, she says things to Fessy that make it sound like she could be, she did it last week too) I don’t know why she does this and she should have learned after she got temporarily blamed for evicting Swaggy. She makes herself look guilty when it isn’t necessary. Maybe she does it as pay back because Fessy smothers her and it’s annoying to her. It’s the opposite of what Kaitlyn does to Tyler. Kaitlyn told everyone she wanted Swaggy out except Tyler. She kept making Tyler think she wasn’t sure. It was her way of getting attention from him. Whenever she wavered, he’d spend more time with her and she picked up on it. Being crazy doesn’t make her stupid. She’s been manipulating him just as much as he’s been doing to her. The Bros don’t want to know the vote ahead of time. They are both campaigning and haven’t given up on trying to get Sam to use her power. They talk more about Ksitlyn going nuts on Brett and how much they dislike Scottie and RS. Winston is sure there is a battle back but Brett tells him not to count on it. Brett has finally realized Sam is closer to Scottie than them so he doesn’t think she’ll use her power. Rachel asked JC about his power. He said it last for 5 weeks. She’s asked what it does. He said if he told her, he’d have to kill her. Fessy is VERY convinced he’ll win hoh if it’s endurance (it is) so I can’t wait to see how long he lasts. Kaycee, Rachel and Angela debate telling the guy about the girls alliance. Rachel is the only one who’s a little hesitant. Rachel and Angela have been dropping bitchy comments about each other to the other women. If you hear any of this, it’s planned and they tell each other what they’re saying. Sam is very upset with Kaitlyn and Hayleigh and feels like they’re being mean to her. They knocked her out of a game of never have I ever by saying they’d never bought whisky. It went downhill from there. Sam’s telling anyone who’ll listen about how they’ve paired up and are leaving her out. Kaitlyn passed around some food Sam couldn’t have and suggested they have a cleaning day tomorrow. Sam took it personally because since being a have not, she hasn’t felt like cleaning. Sam is completely overreacting in this situation. Kaitlyn doesn’t give Sam the time of day on any day and never has. They’ve haven’t gotten along since Sam thought Kaitlyn stole her hairbrush. They’ve just faked it for Tyler. Have nots, power app pressure and no cigarettes is getting to her. Sam is having a bad week ya’ll. Sam said she wanted a season with a group of people there to have a good time and be a family. She said it’s never been done. (She watched youtube clips before coming, not even entire seasons so she wouldn’t really know what’s been done. It hasn’t and there’s a reason for it!!) People can talk about Kaycee and Angela all they want but Sam is the ONLY person who’s just taking up space and isn’t playing the game. I like her but she’s ridiculous in this game! CBS has confirmed the hoh comp will be endurance and be shown on the live feeds. Vegas said it’s going to be the wall comp. Kaycee is being labeled a rat on different sites for telling Tyler about maneaters. She has an alliance and Tyler is her closest person so why wouldn’t she tell him? I agree with Rachel about keeping it quiet in case they need it later because she kind of hangs out with the other side but Kaycee doesn’t. Kaycee knows Tyler isn’t going to blow it up if she tells him. He encouraged her to keep up the act. Foutte never talked to her (they admit it themselves) so why would she trust them with this? She also knows what a big mouth Kaitlyn has so it’s smarter to tell Tyler herself before Kaitlyn does. The comparison I mentioned this year to BBCAN was about the women they cast. Even though the same people cast for both, the shows are cast very differently. US casts more model wannabe types who are looking for love. Canada casts more unique personalities and strong women who want to play the game. (There are exceptions and Canada loves a shomance too) I don’t care about a women’s alliance but I do care about strong minded women who are there to play. Hayleigh is flirting but the prize is her focus. Bayleigh got in a shomance but went right into game mode when Swaggy left. All of the women have winning on their mind except Kaitlyn and shes probably got a hit telling her she’s going to win anyway. They may play badly but they want to win and don’t care which guys they step on to do it. That’s why it reminds me of BBCAN. After tonight, they’ll have 2 slots left for pre jury evictions if it’s a 9 person jury. (I like the 7 person jury myself) This isn’t what I want to see happen but the hg’s as a whole would be smart to fill those 2 slots with Sam and Kaitlyn. NO ONE in that house should trust either on the jury. I don’t see any rational reasoning for who they’d vote for in any situation. Tyler came in 3rd out of 5 people. He won $2,500 and Kevin told him he thought he was high. Next Big Brother 20 – Bye Bye Bros? If the wall is part of it they need to evict Rainbow. Maybe she will get stuck on the wall again and get sent home. “Somebody get me a LADDER!! !” Shades of Krissy, BBOTT. It’s already been reported that they have to win the following HOH comp to stay in the house. That’s the “chance” they are given . Honestly I can’t remember, it was a few weeks ago on Twitter by what I recall was a reputable B.B. source. Have any of them even been studying? They know their days, they mention it daily. Do they know what happened in those days? That’s a mystery. I would like for Rachel to win. She has moved up my ‘like’ list. I’m going to add onto the Sam and Kaitlyn situation for a minute. After they played never have I ever, Kaitlyn started some game where she was making up a story, and I guess the point of the game was everyone was supposed to improv and add onto the story. In true crazy girl fashion, she was front and center to start the game and she went on about how her and JC are expecting a child, but she was laughing so hard she couldn’t get through to the sentence and Hayleigh was laughing right along w her. She kept saying how ridiculous the situation would be and “can you imagine going to a baby shower and the father is dressed like that”. (JC was wearing overalls and so was Sam). Well, this did NOT go over well w the rest of the group and it was quite clear JC and Sam were super offended by Kaitlyn. It was a cringe-worthy moment to say the least, she was a true mean girl in that moment. Did Sam or Keebler tell her to her face that she pissed them off? No, it was a pick your battles moment. They sort of shut her down and moved onto the next game. Shakra is just too full of herself. She probably thinks she is so safe because she plays with all the guys and smiles and throws people under the bus to the girls. Very early on, Rachel said that she “dodged a bullet” by not getting cast for Paul’s debacle, BB19. She and Fessy met each other during that audition process, from what I’ve read here and there. Thanks Shiv, I hadn’t heard about that before. Haleigh, by the way, is accustomed to a cushy lifestyle. She used to drive a Hummer until it got totally squished. Then the poor dear was handed a Lamborghini. She is a smooth, yet naive operator. Keebler? Really? Do you refer to Bayleigh as Aunt Jemima, too? That sure was uncalled for TwoBits. I am surprised you did not call somebody white trailer trash. Just popping in to let you all know I am here catching up and enjoying all the comments from everyone. I thought I would give you all the perspective of someone who does not get the feeds, no BBAD(my cable package cut POP), just the CBS show and BB Junkies, of course. Scottie – my favorite – for now. I liked the way he stood up to “the Bros.” He seems to be pretty smart about the game. Winstone/Brett – interchangable idiots. Either one can leave tonight, but if I had a vote, I would send Winston packing. Tyler – looks like “Danny” from Caddyshack. I like him, but not his alliance. He’s playing a good game. Fessy – I like him. He gets a good edit from CBS, so if there is anything creepy about him, I’m sure I’ll find out about it here! Haleigh – Who? Not a big standout on CBS. Poor girl, no wonder she got the crap app. JC – now here is a surprise – he gets a great edit from CBS, but is he maybe a little creepy? I certainly don’t have a problem with his use of the “N” word in the context it was said – it wasn’t offensive to me. And I agree with Mel that the language barrier could be a factor in how he is perceived in the house. I still like him, for now. Sam – Oh Sam. I have a love/hate relationship with her. I hope she doesn’t use the power tonight. If it were me, I would leave it up to fate next week. Plus, one of those Bros has got to go. Kaycee – Who? Another “off the radar” floater – at least that is the way she is portrayed in prime time. No idea what she is capable of, but, like Kaitlin, I could see her making a big move if she gets further along in the game. Bayleigh – I like her…should I? I felt bad that she lost Swaggy(another confession – I liked Swaggy purely for the entertainmet value). Another reason I want Miss Cleo(Kaitlin) gone. Hey, can we call Kaitlin Miss Cleo? Angela/Rachel – Who and Who? Wouldn’t even know it if either one disappeared from the house tomorrow. So, from someone who is ONLY watching CBS, that’s how the HG’s look to me. Let me know, or I will read here, if I need to make any adjustments. Hope you are all having a great summer. Will check in tonight to see how the Wall comp turns out. Rooting for Fessy, Bayleigh, Rockstar, or Hayleigh win. But does it really matter? Won’t this week’s HOH be completely pointless because of Sam’s power? Thanks again SteveBeans for another summer of Junkies! Mel, too! I’ve wondered where you have been. Jannie,I pretty much agree with you on all accounts.I do watch BBAD.i think you have a pretty good read on these houseguests. Anyone know what time the HOH comp will begin showing on the feeds? It’s usually on shortly after the show ends, maybe an hour or sometimes less. Haleigh is the one who came up with the name, Maneater(s) for the all-female alliance. She sings “maneater” to the tune of an old song, “Maniac.” Rachel and Angela are self-designated as the secret F2, the Vixens. Both of them see right through the Maneater crapp. Rachel has one of the best social games in the house, imo. She has come very close to winning more than just one comp, too. She and Angela have agreed to display conflict in front of the other players to conceal their F2 deal. But I think that Rachel has to be on guard about Angela, who could still stick a knife in her back if necessary. Just saying. Wow. She’s singing “maneater” to the tune of “Maniac” (from Flashdance). Apparently she’s never heard of the Hall & Oates song “Maneater” that came out around the same time. Yeah, yeah this was 30+ years ago, but it still strikes me as funny. It would be nice to see Brett stay if for no other reason to be a thorn in Chakra’s side. She seriously believes the entire world revolves around her and I can’t wait to see her face when he stays. Watch her shake in her boots if he wins HOH. Unfortunately , nobody will probably leave this next week. I hope they really do keep it from her and I can’t wait for that reaction!! Me too. The waterworks will start, she’ll start having visions & who knows who will talk to her in her dream tonight. Watch out Tyler because she’s going to hunt you down & once she finds you its a wrap for you for the rest of the night. She’s going to latch on to him like a leach. I’m over her as well. Hoping she’s next to go! Long time reader here who rarely comments, but does Winston remind anyone else of Beavis or Butthead, especially when he wears that hoodie? Scootie reminds me of Sid from Ice Age, lol. Jessica Graf did a side by side of Scottie and Sid on her Twitter the other day. I’m glad I am not the only one that sees it, lol. While astral traveling across the livingroom with my psychic, intuitive kitten, I heard Tyler say to somebody that he thinks of self-eviction every time Kaitlyn climbs onto him. Too bad that I missed seeing who heard him say it. Also, it looks like Sam is being mentally eaten alive by the DR folks. She was called in and came out trying to gather everyone to give them some kind of announcement, maybe a clarification? The DR has caused half her stress this week imo. The apps appears to have no impact on the game. I think they should have had to decide immediately whether to use or not to make it more exciting. Tonight, if Sam’s power app is used the competition to get back in the house is a puzzle game. It should be the same puzzle game next week if her power is not used tonight. Is it the same thing they accidentally had a shot of on the show the night Steve was evicted? I don’t remember what they accidentally showed? The camera went to a room that was set up with some kind of comp/puzzle thing. It was before or after a commercial and just for a couple seconds. Who will win hoh guys? If it’s the wall and I believe it is, Kaitlyn, Hayleigh, Rachel, Angela and JC are contenders for me, withe Tylet as a long shot. I don’t have a sense of Bayleigh, Kaycee or Sam’s core strength so I can’t guess on them. We also have to factor in who wants to win. I don’t think JC does but could be wrong. Rachel and Angela don’t want it but they may change their minds once they see what it is and Brett & Tyler fall. Sam’s made it clear she doesn’t want to win either. I can’t handle a Sam hoh because covering her late night one on one convos would be torture. I know I’m hard on Sam but I can’t root for her until she wants to play. I’m rooting for her to play but that’s the best I can give her right now. I kind of want Kaitlyn to win, get ride of Brett and have him come back right after he surprised her by staying tonight. Just kinda…I’d have the same problem recapping her one on one’s but her craziness does at least make funny feeds. I want Rachel to win…just so I can watch Hayleigh,Rocky Horror and Psycho squirm and kiss her azz all week…. I kind of do too but I’m liking her game and don’t want her to be a bigger target. She’s came in 2nd on two comps and people are going to start talking about it…or they should. Except that her back has been bothering her, I do think Sam could win endurance. She is constantly cooking, cleaning, or doing something. She doesn’t ever just lay around like the rest of them. The only thing I would like if Chakra won HOH would be seeing her reaction when she didn’t get any pictures of her boyfriend. Or better yet, if they gave her a picture of him snuggled up to some other girl. They won’t, but it would be funny. What I would love to see if Kait won, is Bayleigh using her power and seeing the look on her face when her noms never go OTB. Bay has said she won’t use it unless she or Fessie are threatened. She wouldn’t be worried about Chakra putting them up. I think if it was down to Kaitlyn, Hayleigh, Rachel, Angela, there’s no way Rachel or Angela would let them take it. I think Rachel really wants to win a comp, so I’m going w her. Ya she would be my pick too but she doesn’t want to win. That’s why she was so mad at Winston. She wants to take a step back and is afraid of being targeted. She and Angela talk about it when they strategize. I agree that will change depending on who’s left up there. Kaycee is built like a Mack truck. It’ll be interesting to see how she does. She has seemed to be very levelheaded, too. I would love to see her blast herself out of the background. Dan, she was super close behind Scottie in the spinning comp. She’s having back problems? It’s possible the spinning caused her back problems. True, I just hadn’t heard her say anything about her back so I didn’t know. James got into that comfortable squat position and he was good to go! For a life coach, Kait is really self absorbed. Hahaha, I just can’t let that one go can I? I’d like it if Sam used the power on Winston but he screwed up the puzzle and left anyway. Winston: Still clinging to that blue cup. Anyone interested in seeing a Chakra nip-slip? I have one screen capped. O.K. I just heard Chakra tell Sam that Scottie came to her and told her about the Bros plan. That whole CBS/Chakra night dream vision hit was bogus. Proves that Production coaches them in the DR.
My husband knows not to ask! Lmao! DVR it. It’s doubtful the outcome will be a surprise. Or just agree to go as long as you are home by ? :00 (whatever time it’s on where you are). Tell hubby that you have to be there because one of your ‘boyfriends’ (Brett or Winston) is leaving the house. Lol. Scottie and Tyler talking…Scottie says the vote should be 8-3 for Brett to go…..
For Brett?….either I am lost or they are delusional. As of last night I was pretty sure that Winney had the votes to stay. It should be 6 to 5 for Brett to stay unless Tyler decides to talk to Kaitlyn in advance and tell her they don’t have the votes. If that happens and she votes for Brett to stay, 7 to 4.. Bayleigh could be a flip for her own reasons and that’s an 8 to 3 but in the opposite direction of what Scottie thinks. If Hayleigh gets wind from Kaitlyn the votes arn’t there, then it’s 9 to 3. I’m getting a hit that says 6 to 5 and Winston goes. What is up with the blue mug by the way? They all use them but Winstons is ALWAYS in his hand. I think he caries it around empty half the time. Prediction: JC, Rachel and Kaitlyn battle it out on the wall. Both her and Jason did great…Alex only won because of deals made….those were the last 3 standing…. There was a lot I hated about last season but it was saved for me by Kevin…he is probably my favorite player in recent years…. I hated almost everything about last season but the finale totally made up for it. I’m not sure how long Chakra can hang in there for endurance. She does have the body type for the wall comp, but she never does anything except lay around on the guys. The only thing on her body that gets any exercise is her mouth and her tear ducts. She could also get a “hit” and her left hand start to tingle. Would she have to let go if that happens? Colby, you are spot on. I don’t think Fessy will last long either. I can see Sam being one of the last on the wall. Although Kait needs to win, or she will not be much longer in the house. Hard to say really…rocky horror will either be one of the first off or one of the last….she was glued onto that living room wall the other day for 20 minutes. Lol. Course she was face first and didn’t have water dumping on her but still…I think Angela will do well…she has good core strength and can squat pretty easily (she really did just as well as Chris on that surfboard). His legs were about to go out too..Faysal…I just don’t see him doing well at all…he might surprise me like Jason Dent did last year…Rachael had trouble on the climbing wall a couple of days ago so I’m not sure about her…I can’t see bayleigh and Hayleigh making it too long either…. How old do you all think Tyler really is? Would it surprise you that he is closer to 27 and not the 23 that his bio. indicates? I’d buy 23. He’s in the sun a lot so that could make him look a little older.They all look alike when they’re in thier 20’s to me anyway. Would you buy 23 if he pretty much said he was older? new show called Total Knockout. Oh, I missed TKO. Anyway Tyler was laying, drowsy, on the HOH bed two nights ago on BBAD. He was telling a story and he said something like “that happened a few years ago when I was 24”. Rainbow Bright will be the first to go. 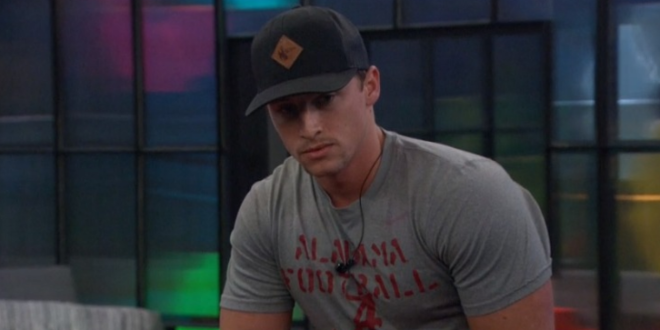 Tyler, I think will fall off early as he is getting comfortable in his role in the house and does not want to draw alot of attention to himself. Fessy will drop out early and blame it on his hair. Dan, I’ll copy this here. I’m too lazy now to go into more detail of what he said, but I might just do a search and find it. He shut up real quick like he had let a cat out of the bag. Anyway Tyler was laying, drowsy, on the HOH bed two nights ago on BBAD. He was telling a story and he said something like “that happened a few years ago when I was 24”. I think I’m going to stay off of here after I send this message because I I want to watch it play out and not know ahead of time. I have not gone through all the messages but I have one question. Hopefully it hasn’t already been talked about but bear with me..
I’m really curious to know who you want to be evicted? my choice would be Winston. Either for me. Brett may be a better player but watching Winston play terribly has entertainment value too. That too. It would be fun watching Winney falter some more. Would be fun to watch the meltdown when he has to keep playing and losing w/out his bro. Winston is no real threat, it would be best to evict Brett at this point, it will only get harder later. Did anyone else get a DM from CBS this morning asking if Sam should use her power app tonight? I didn’t. At least not that I know of. I have my doubts about how long JC will hang in there. He doesn’t really want HOH, and he doesn’t feel threatened by either side. We all know JC is all about JC being comfortable and doing what he want to. I think he will only hang until the Foutte side numbers are down. I don’t think Bay will do very well, but I do think Haleigh may do well.